This year was the most difficult in finding the right costumes! The girls started out with other ideas. Even searching a month in advance, finding their costumes in the right sizes, proved to be a challenge. Bella wanted to be a Rockford Peach but I couldn’t find one in a tween size and honestly didn’t have the time to sew one. Ryleigh has been asking for months to be Neytiri from Avatar but the only kids medium costume came at a $200 price tag! When I offered solutions like a blue unitard, she wasn’t satisfied. Ummm, NO. I’m not spending that kinda money, kid! Sarah Sanderson from Hocus Pocus and a Coco inspired La Catrina! Even the hubby got festive and pulled out the old Sasquatch suit from the Xmas gag photo we did years ago. Penny didn’t like that suit so much… even after she watched him put it on and CLEARLY knew that it was daddy! Can you guess what Penny was? Penny totally rocked her curly fro and it was the perfect hair for a Richard Simmons costume! We didn’t even have to bribe her. She was so ecstatic for the sweat bands..lol I’ve come to realize that Halloween is Penny’s favorite holiday. She loves dressing up and helped herself to a little skull face paint this week! 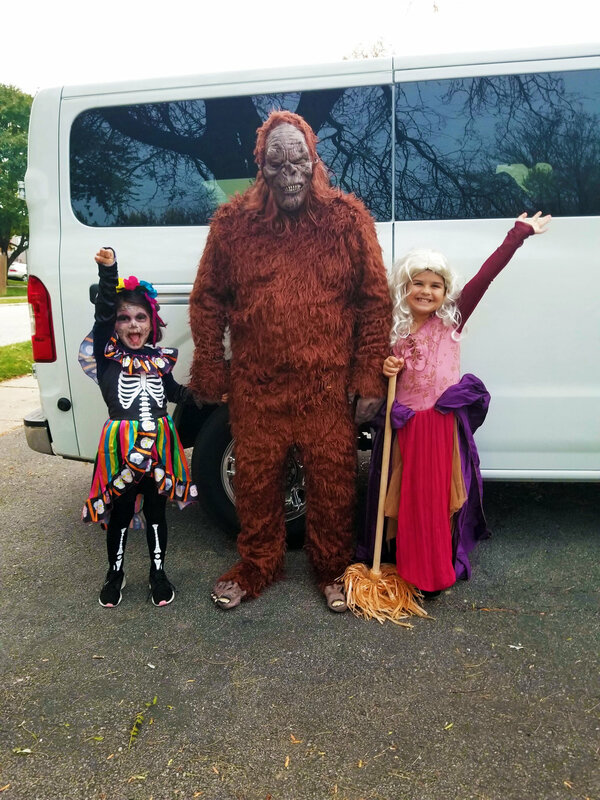 What did your kiddos dress up as this year?